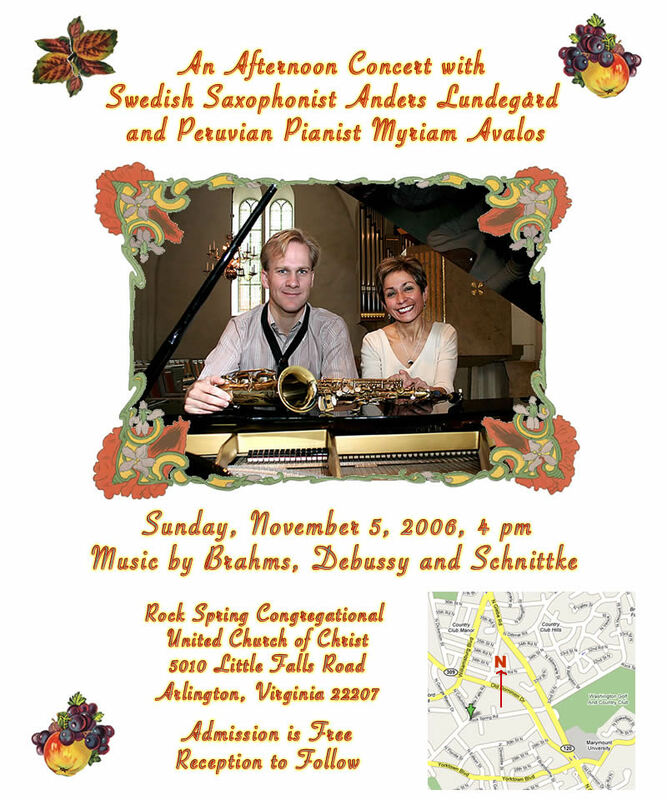 Presbyterian Church - Leesburg, VA.
Terry Sisk - piano&organ, Bennett Barsk - voice. 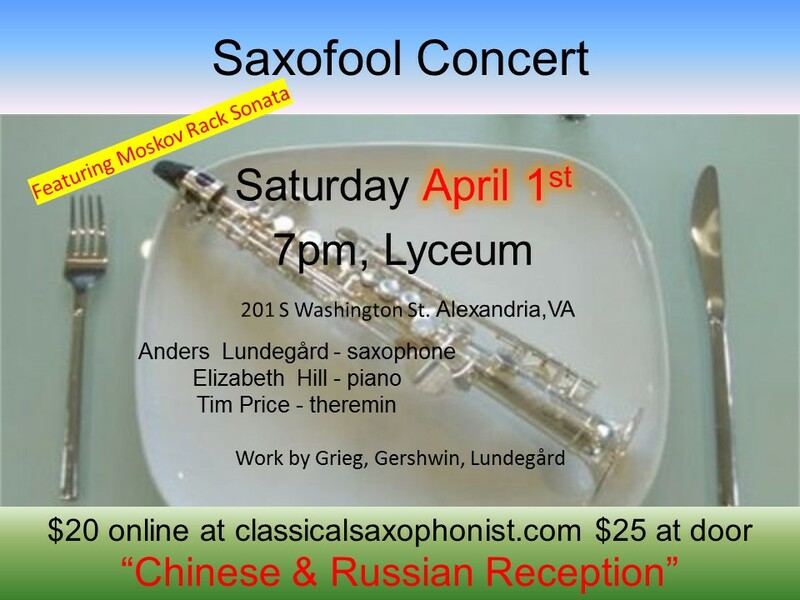 Millennium Stage - Kennedy Center, Sunday April 4th, 6pm. 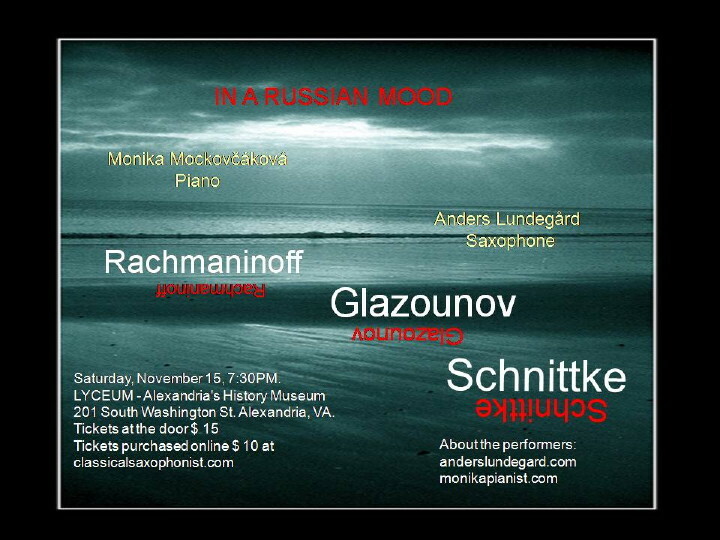 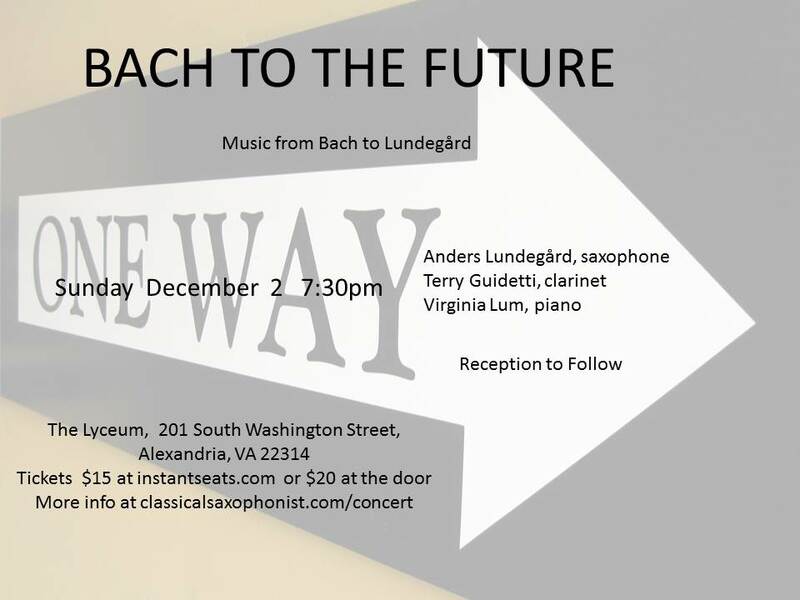 Russian concert at the Kreeger Museum, 2401 Foxhall Road, NW; Washington, DC 20007, Saturday, November 7, 7pm. 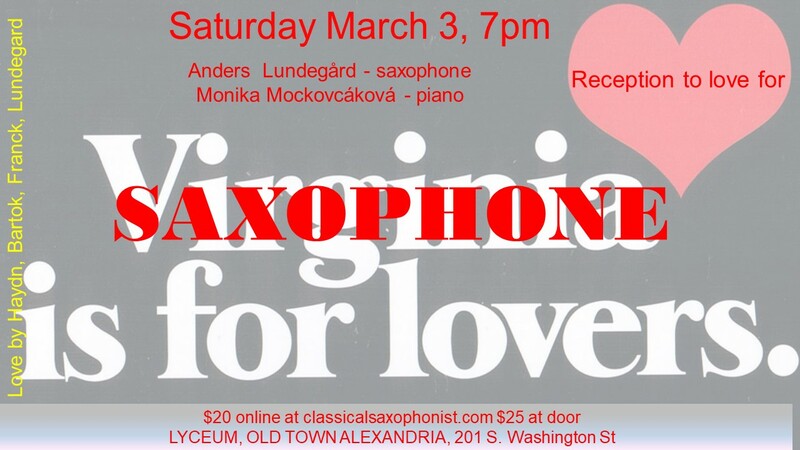 Swedish folk music, jazz and more with The Swedish Jazz at Embassy of Sweden - House of Sweden Washington D.C.Open house: Saturday, May 9, 10am-4pm. 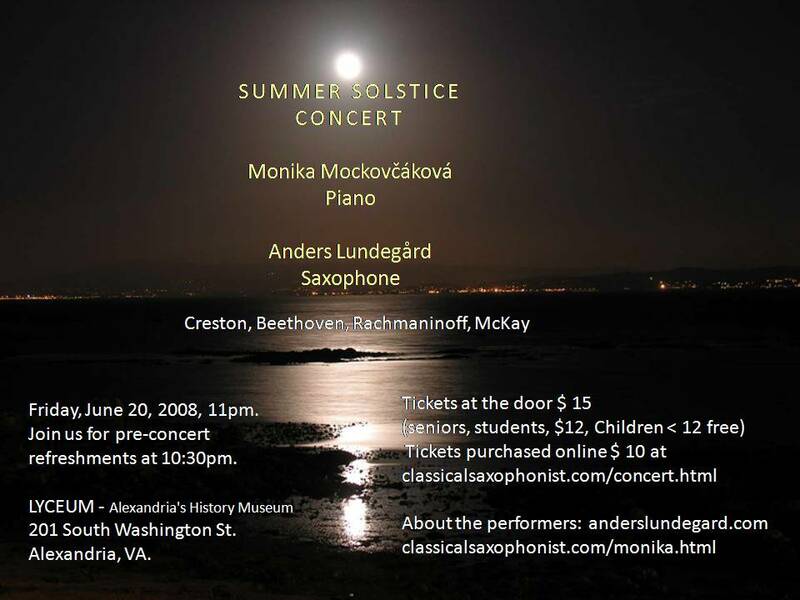 SUMMERSOLSTICE CONCERT With Slovak Pianist Monika Mockovcáková Friday, June 20, 2008, 11PM at the LYCEUM, Alexandria's History Museum, 201 South Washington St, Alexandria, VA. 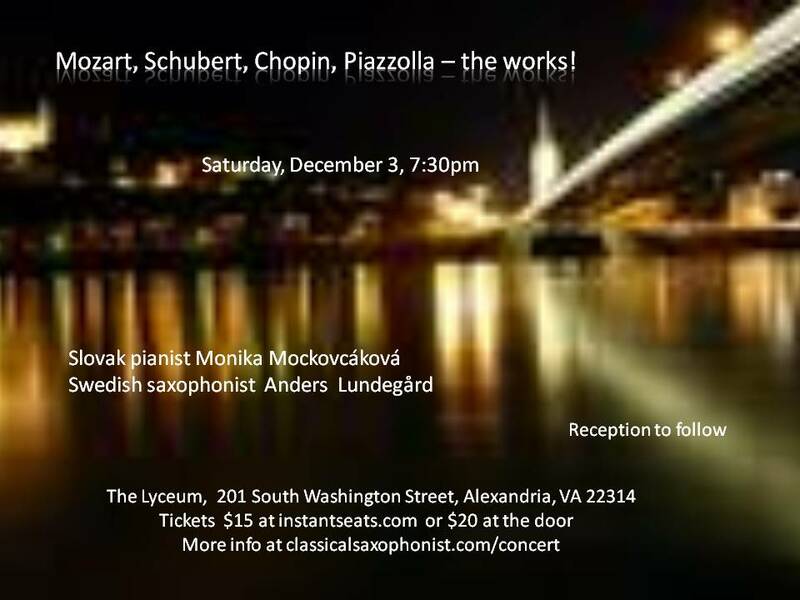 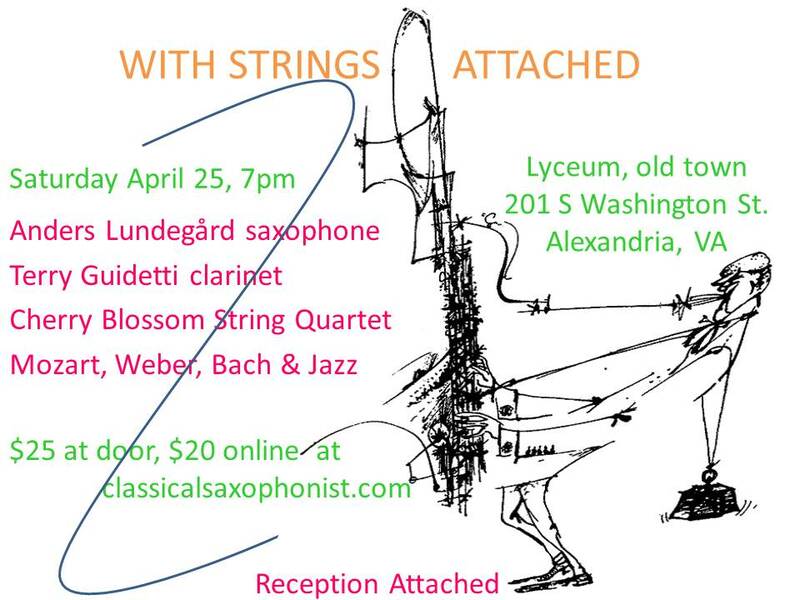 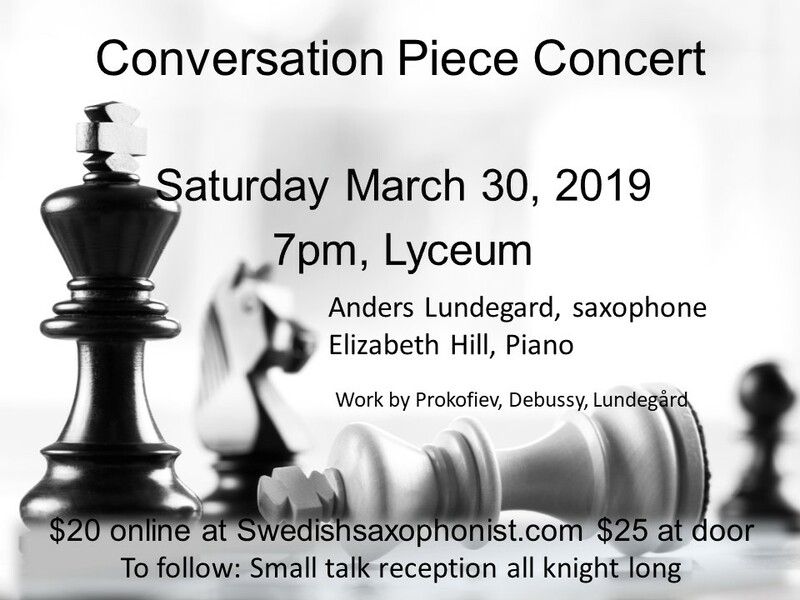 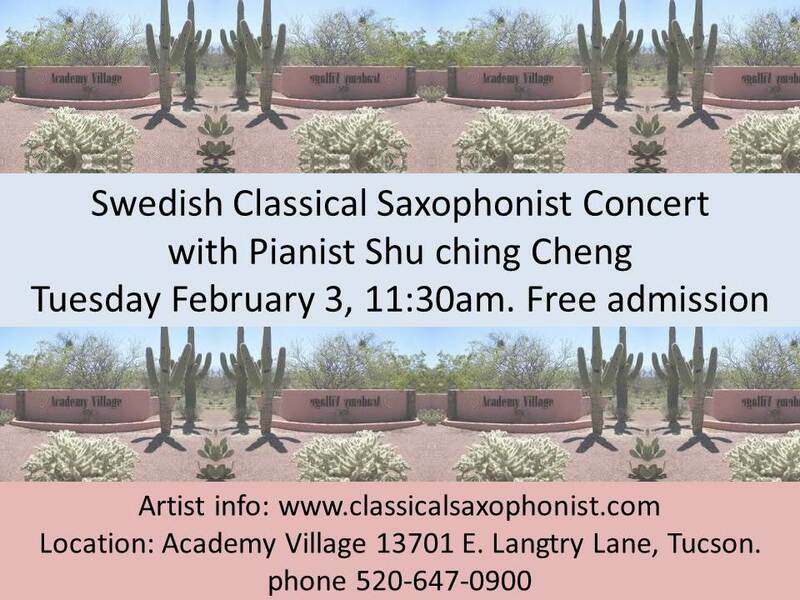 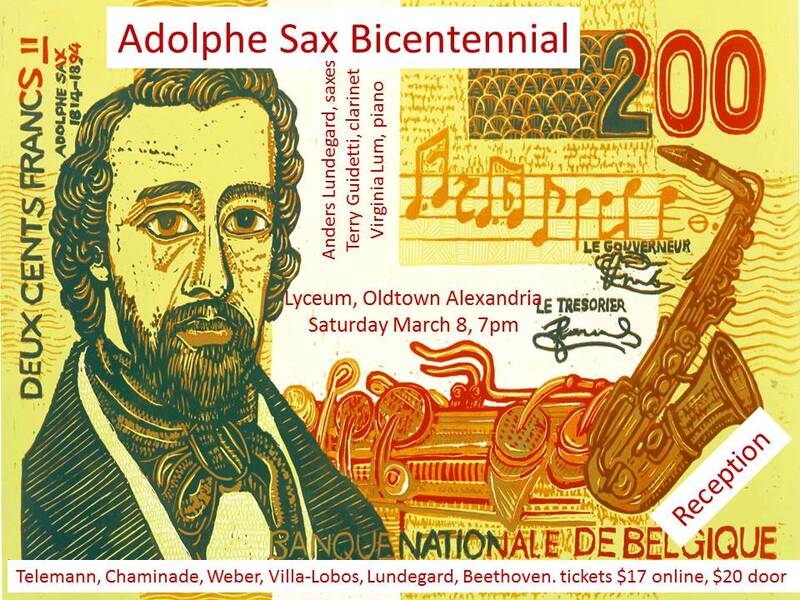 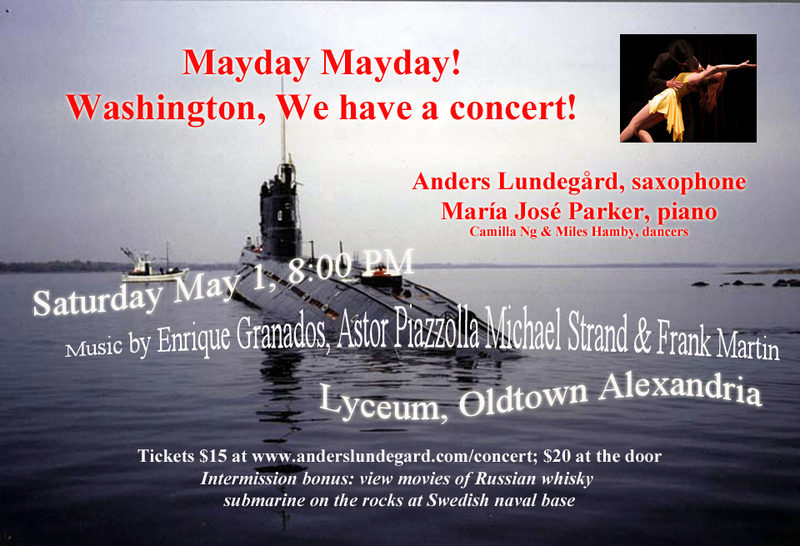 In partnership with the Embassy of Sweden Admission by invitation only, please contact classicalsaxophonist for more information. 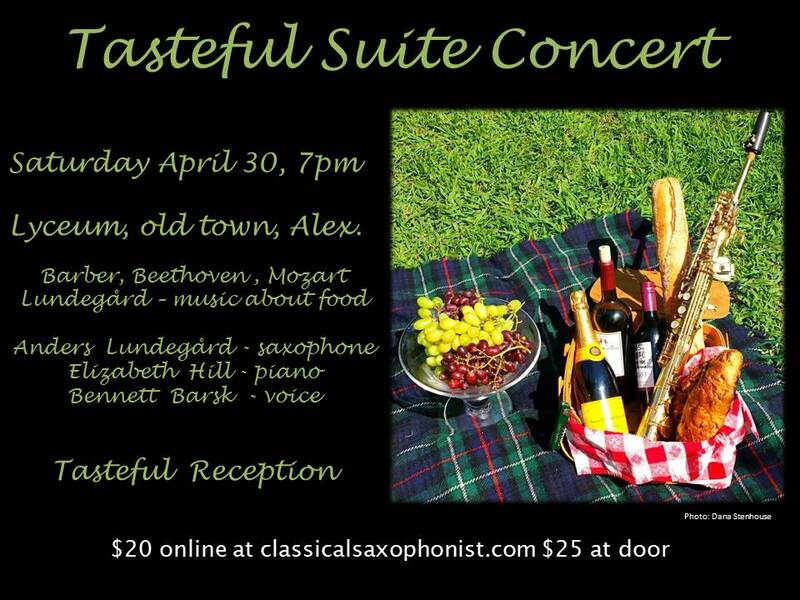 Reservation required. 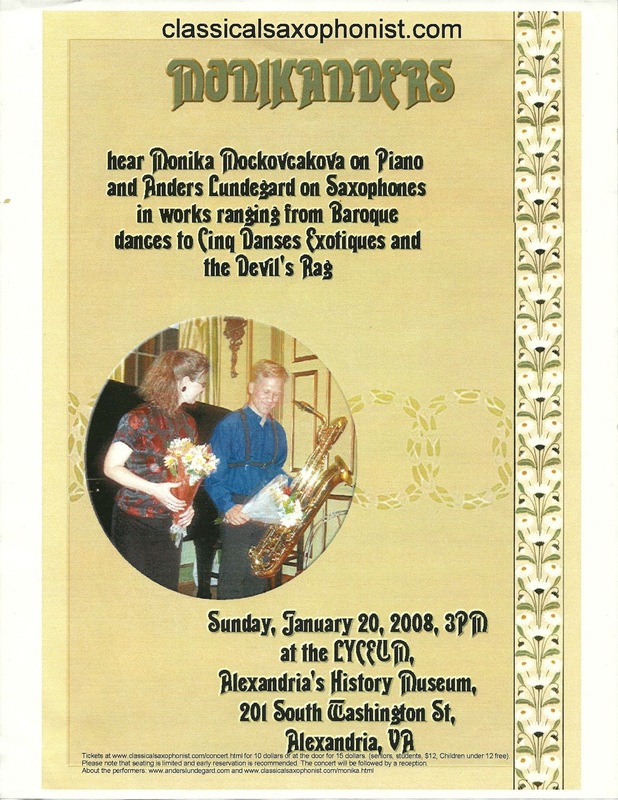 MONIKANDERS CONCERT With Slovak Pianist Monika Mockovcáková Sunday, January 20, 2008, 3PM at the LYCEUM, Alexandria's History Museum, 201 South Washington St, Alexandria, VA.
Music by Brahms, Debussy, Schnittke. 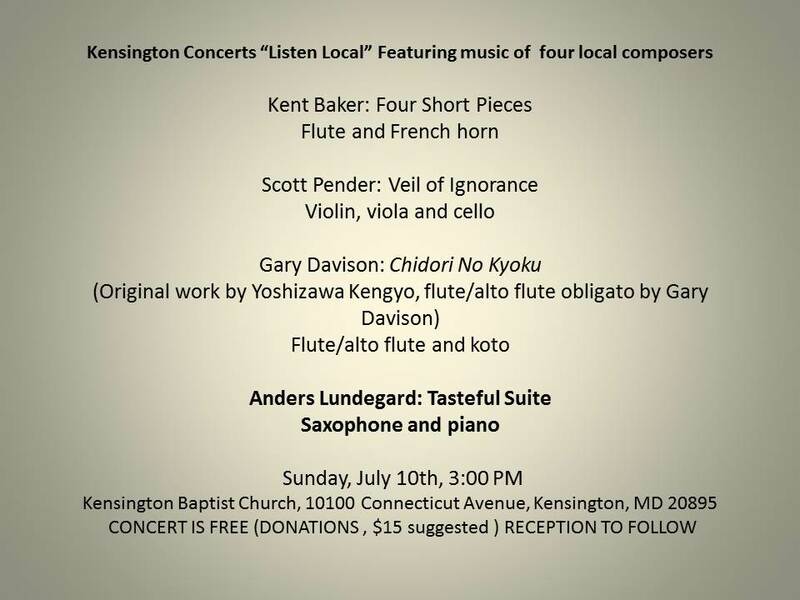 Wednesday, August 11, 12:30 pm, The State Department, Washington, D.C.